During Holy Week I visited the Church of San Vito on the Esqualine Hill. The titular cardinal, Umberto Betti, OFM, died on April 1st, making this church the most recent vacant titular church. We have often driven past this church, seeing the ancient ruins that are part of the structure. The entrance to the church is on the other side from what we see while driving by, and you approach the entrance door by going through the Arch of Gallienus, built by Augustus in the 1st century AD and restored in 262 AD. The church was founded in the 4th century to honor the two martyrs SS. Vito and Modesto. It was rebuilt in 1477 and restored many times since. The simplicity of the nave and apse reminded me of St. Augustine's Chapel at the motherhouse of the Anglican Order of the Holy Cross in West Park, New York, with the large painted crucifix behind the altar. This design gives great focus to the eucharistic table. As I sat in the nave, two women came in to prepare for the afternoon Mass. One took a dust mop and the other a dust rag and they went over the whole church. It seemed very clean when I first entered, and I discovered why!
. The side altar on the right wall contains 15th century frescoes attributed to Antoniazzo Romano. On the left wall is a memorial dated 1620 that recalls how a Colonna family prince was healed after he was bitten by a rabid dog. This is the Pietro Scellerata. Legend says that if the stone is scratched and swallowed it has the power to heal those bitten by mad dogs. SS. Vito and Modesto (Saints Vitus and Modestus) are considered patron saints of rabid people. I recalled the readings from Palm Sunday as I walked under the arch of an ancient gate to find the front door to this church. While I did not find people waving branches or spreading clothes, I did find two women on the inside, mopping and dusting to prepare for the celebration of the Eucharist that was soon to take place. The large crucifix in the apse brought my thoughts to thinking ahead and anticipating Good Friday. Here, in a little corner of Rome, a community of Christians is gathering again this year, as they have done for over 1,500 years, to meditate on the passion of Christ and to celebrate the Resurrection! 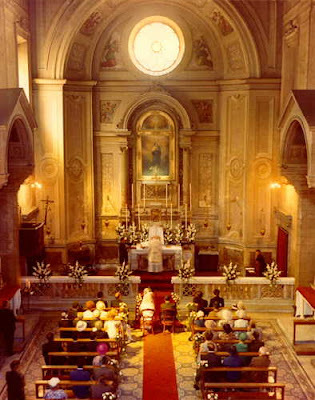 Vatican II and San Vito: This photo is of a wedding in San Vito before rennovations of 1973-1977. The parish was radical in the way it changed its sanctuary to follow the liturgical guidelines of the Second Vatican Council. This week my class of 5th graders helped make sandwiches that were distributed by members of the Community of Sant'Egidio to the hungry here in Rome. Romans use olive branches on Palm Sunday, even though there is an abundance of palm trees throughout the city. In the Gospel of Mark (that was read today) there is no mention of palms. Distributing leafy branches in Piazza San Ignazio. Processing to Caravita from the Piazza San Ignazio.